There’s decades of history in the names and notes engraved on the paving bricks in the Santa Clara Veterans’ Memorial. Veterans of every U.S. conflict from the Revolutionary War to the Iraq War are remembered. “Every brick tells a story,” said Veterans Memorial Committee founding member Marlys Lee. There is a brick in memory of Albert Alvarez Jr., the longest-held Vietnam prisoner of war (POW) — Santa Clara Alvarez Park is also named for him. There’s a brick honoring Santa Clara resident Thomas Cronin who was a Japanese POW for 1,004 days. Local resident Leslie Allen Bell, who received the Congressional Medal of Honor for his service in the Vietnam War, is also remembered at the monument. There are also bricks have been added for soldiers killed in Iraq: Wes Canning USMC, Kyle Crowley USMC, Adam Wayne Esty USMC, and Travis Layfield USMC. Santa Clara’s memorial was a grassroots effort from start to finish. Dedicated on Veteran’s Day, Nov. 11, 2002, the Memorial was the brainchild of Santa Clara residents Jim Ash, Jim and Marlys Lee and Ray Gamma. 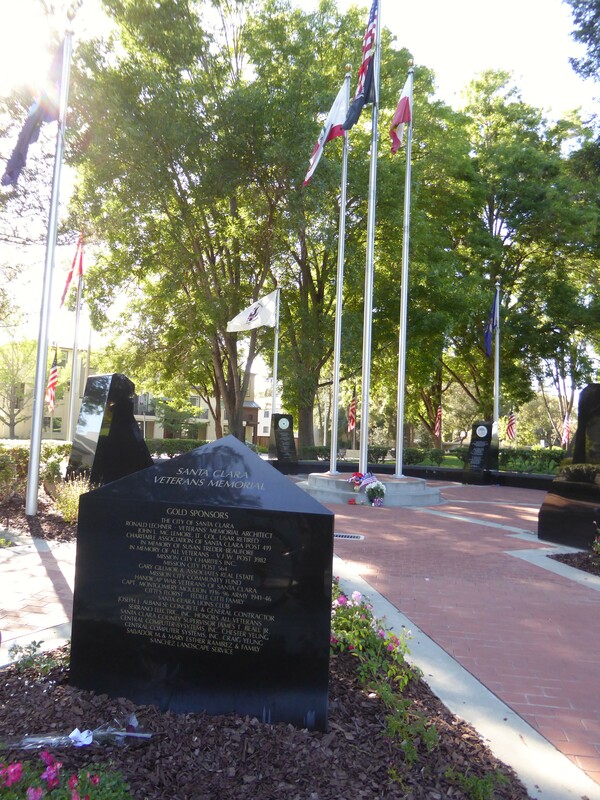 The four were instrumental in presenting the idea of a memorial to the City Council in 2001, forming the Veterans Memorial Committee, developing the design, and raising the $260,000 to build it. The memorial was designed by Santa Cruz architect, Ron Lechner, who donated his design work. The idea began at a retirement dinner at the Santa Clara’s Elks Club in April 2000, where the four shared a table, according to Jim Lee. The conversation moved on to the possibility of replacing two memorials that used to stand in the City — one at the now-gone War Memorial pool and the other on Franklin Street that had been removed during the redevelopment of the 1950s. “We sat there and drew out a plan for what the new memorial might look like,” Ash continued. The group received its first major donation at the Citywide July 4 picnic in 2000 — $5,000 from John McLemore, a retired Army Reserves Lieutenant Colonel and former City Council Member. “It was his entire retirement check from the military,” added Jim Lee. The group was surprised by the community’s enthusiastic response to the proposed monument. “I didn’t think we could do it as fast as we did,” he said. In 2002, the stock market had crashed, which threw a wet blanket on corporate donations. “I got no response from letters to corporations except from United Defense and Central Computer,” he said. However, through the sales of memorial bricks, with donations from local clubs, businesses, and veterans organizations — including a $35,000 donation from American Legion Post 564 — within two years the group had raised enough money to start building. The support of the City of Santa Clara and the Parks and Recreation Department comes in for special praise from the memorial’s founding team. “I can’t say enough about the City and the Parks people,” Jim Lee said. “The City Council gave us 110 percent support,” added Ray Gamma. One of the unique features of Santa Clara’s memorial is its inclusion of the Merchant Marines as well as the other five branches of the armed services. 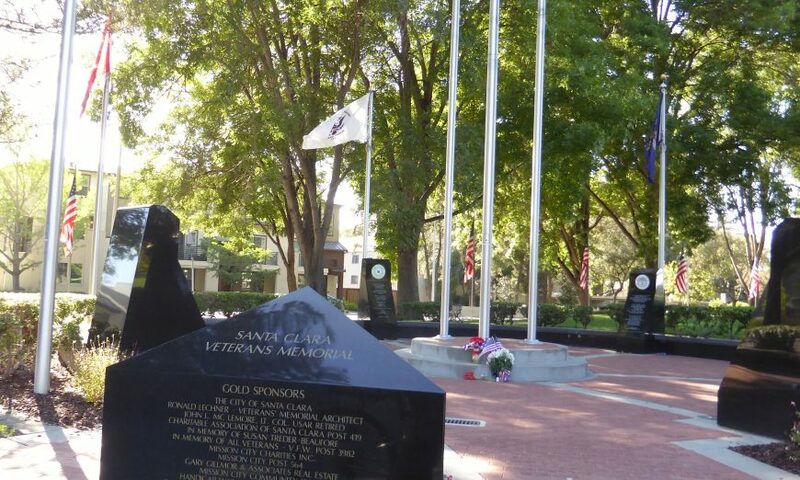 The Santa Clara Veterans’ Memorial is located in Central Park, behind the Community Recreation Center near Kiely Boulevard. Applications for memorial bricks are available at the Community Recreation Center. Mission City Community Fund Honors John G. Figueira Jr.